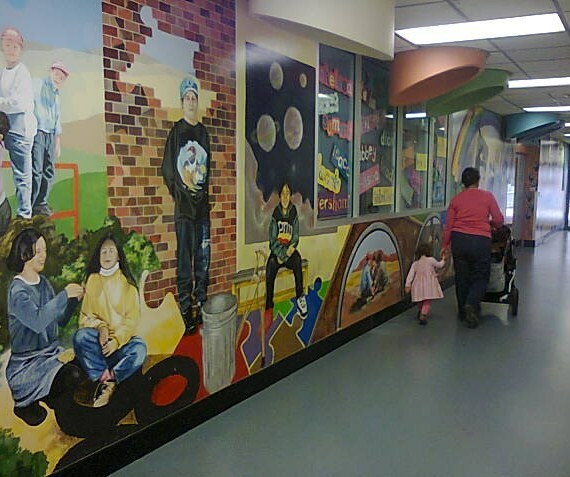 This mural was painted by Alana Preece and students of the Children's Hospital School in July 1999. The Women's & Children's Hospital in Adelaide has a range of support services on offer to patients and their families during their stay. Whenever we visit the Women's & Children's Hospital, the artwork on display often allays our fears, momentarily distracting us from the purpose of our visit. The aim of the Women's & Children's Hospital Foundation's Arts in Health program "is to integrate the arts into the life of the Women's & Children's Hospital to improve people's health and well-being". Arts in Health was officially launched on 28th January 2010 and delivers a range of activities at the Women's & Children's Hospital such as therapeutic arts; music and performing arts. 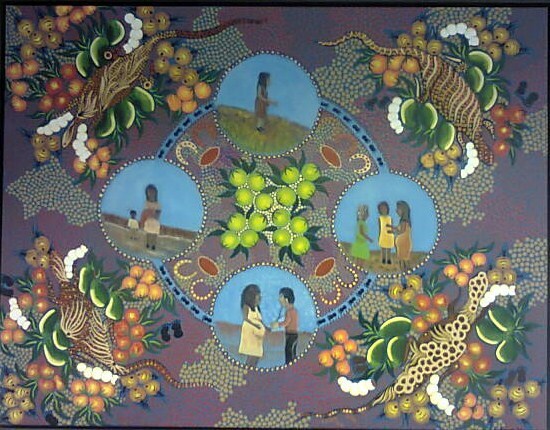 This painting shows how aboriginal women are supported during pregnancy by their relatives and community health services with a focus on a healthy diet. Artwork is titled 'Women and Children Gathering Bush Tucker' created by Katrina Williams in 2009. Artwork ranges from murals to exhibitions and can be found in each wing. There's Gizzy the Lizard - an Australian Monitor Lizard who was created from glass and ceramic as part of the Perception Project to raise awareness of vision impaired children's experiences. We enjoyed exploring Gizzy's textures by touch. Visit Gizzy on the ground floor of the Good Friday Building. Gizzy the Lizard is an interactive art installation created by artists Lynn Elzinga-Henry, Anni Luur Fox and Suzi Windram in collaboration with the Women's & Children's Hospital Foundation's Arts in Health program, the Blind Sporting Council and the Women's & Children's Health Network. The perfect artwork for the vision impaired, accompanied by description in braille. 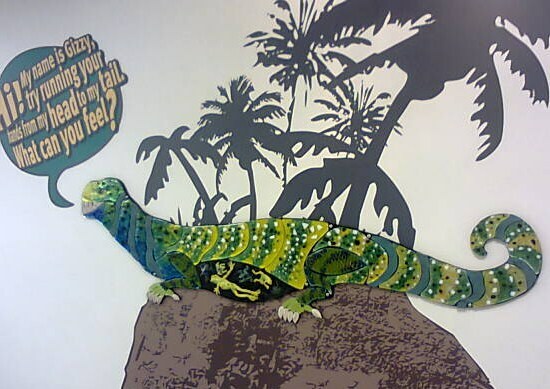 Arts in Health's currently hosting a joint exhibition to celebrate World Animal Day (4th October 2013). On exhibition in Gallery A and for sale are two series of artwork, the first is titled Warm Fuzzies by Gabriel Cunnett and the second is The Polka Dot Gallery by Leanne Wachtel. The exhibition is on display from 12/9/2013 - 31/10/2013. There are three main gallery spaces at the Women's & Children's Hospital: Gallery A (located on the ground floor along the corridor leading to the Good Friday Building); Gallery B (Level Two - Queen Victoria Corridor near Hospital Café) and Gallery C (Level One - Gilbert to Samuel Way corridor). Part of the art on exhibition to celebrate World Animal Day is artwork by Gabriel Cunnett, whose exhibition is titled 'Warm Fuzzies'. On the left is 'Milkshake' - acrylic on canvas $325 & on the right is 'Pigs Might' - acrylic on canvas $175 (sold). In Gallery A, artist Leanne Wachtel's exhibition The Polka Dot Gallery is a tribute to Leanne and her partner, Ian's son, Jack "who was diagnosed with a fatal condition in 2011 and was born sleeping at 5 months and 6 days". Warm Fuzzies was the culmination of artist, Gabriel Cunnett's experience of visiting the Women's & Children's hospital with his two young children and his desire to contribute "in a positive way for families with their hospital journey". Arts in Health's hosting a joint exhibition for World Animal Day on 4th October. 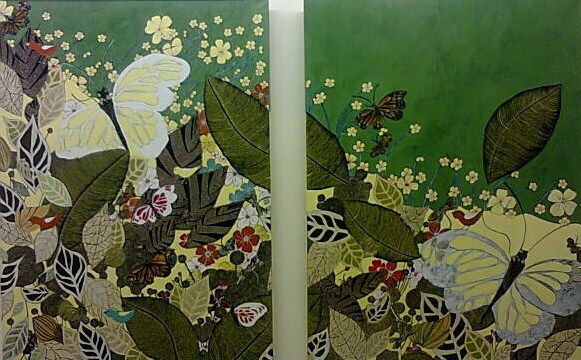 Pictured here are works from artist, Leanne Wachtel's 'The Polka Dot Gallery' exhibition - this artwork is titled 'Botanic Butterfly' - acrylic painting $500 for the set of two paintings. In Gallery B, explore The Wild Inside through a series of artwork by Katrina Allan (on display 12/9/2013 - 31/10/2013). Gallery C hosts The Princess Who Would by Diwani Oak. The exhibition comprises a series of artwork originally included as illustrations in the children's book titled The Princess Who Would (author: Liz Miriam). Diwani's donated this beautiful collection of art to the Women's & Children's Hospital (on display from 24/9/2013 - 31/10/2013). Sustain yourselves at Nic Nath Café on the Deck which offers a delectable range of food and beverages such as locally roasted espresso coffee, pizza and fresh salads. Sit and relax while the kids explore the play-deck. Given the right circumstances, a trip to the hospital can be fun! Why? Experience the brighter side of a hospital visit. Thanks for this Jenny, I never realised how much emphasis is placed on art there. The kids must love it! Great article. You're right - the artworks in the hallways are a fabulous distraction from the hospital visit. Last year, I bought some of the art that was on display.